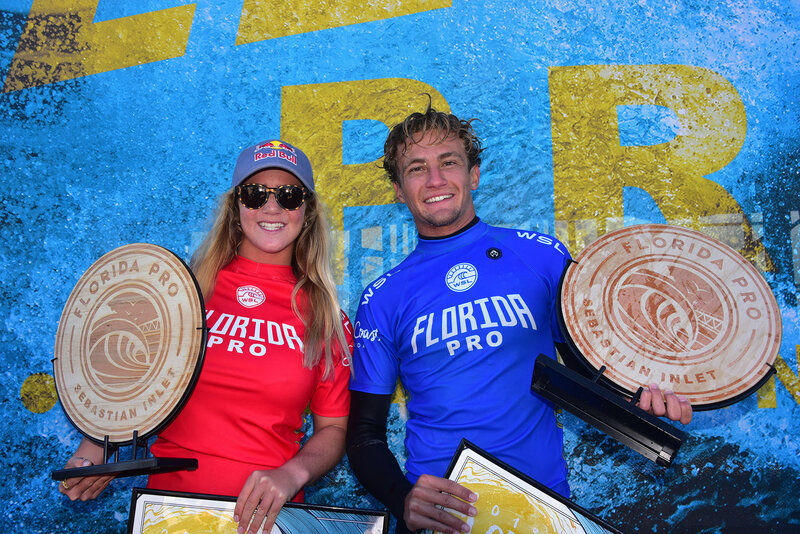 Pictured: Caroline Marks (USA) (L) and Noah Schweizer (USA) (R) claimed commanding wins at the second annual Florida Pro. The stars aligned for Marks once again with another dominant performance that culminated in back-to-back Florida Pro victories. The 16-year-old phenom took over the Final against 2018 World Junior Champion Kirra Pinkerton (San Clemente, Calif.) with brilliant wave choice in the wave-starved heat and still managed to post an excellent 8.83 (out of a possible 10) — the women’s top single-wave score. Marks had her eyes on the win all week and made that a reality to continue her reign over the QS rankings. Caption: Marks’ impeccable backhand couldn’t be stopped. Caption: Schweizer with the iconic Sebastian Inlet Pier in the background, the spot he grew up competing. ← Previous Previous post: 2019 AMA Big 6 NGPC Race Season set to kick off this weekend with the Adelanto Grand Prix.